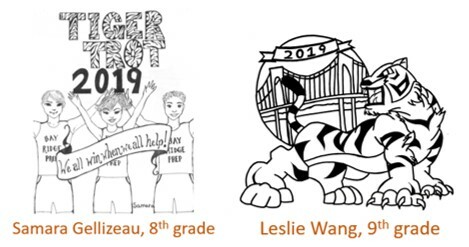 In keeping with Tiger Trot tradition, the 2019 Tiger Trot shirt will feature the artwork of 2 talented Bay Ridge Prep students. The winning designs were selected, by faculty and staff, from over 90 student entries. The t-shirt will also feature the names of generous business and family sponsors on the back. The event shirts will be worn by students during the Tiger Trot on May 3rd and many students and faculty members wear their Trot t-shirts throughout the school year. Below are this year's winning designs! Every student will receive a free Tiger Trot t-shirt on the day of the race. Additional t-shirts (in adult and youth sizes) are available to order online. Cash and check will be accepted. Pick-up and delivery details are available on the online order form. Please submit your t-shirt order by April 24.